In April 2011, Freeb!rds began researching a key management program that could help standardize their locations’ key control, improve concerns about key duplication, eliminate having staff wait for locksmiths to arrange a service call, and the additional expense of the locksmith service cost. 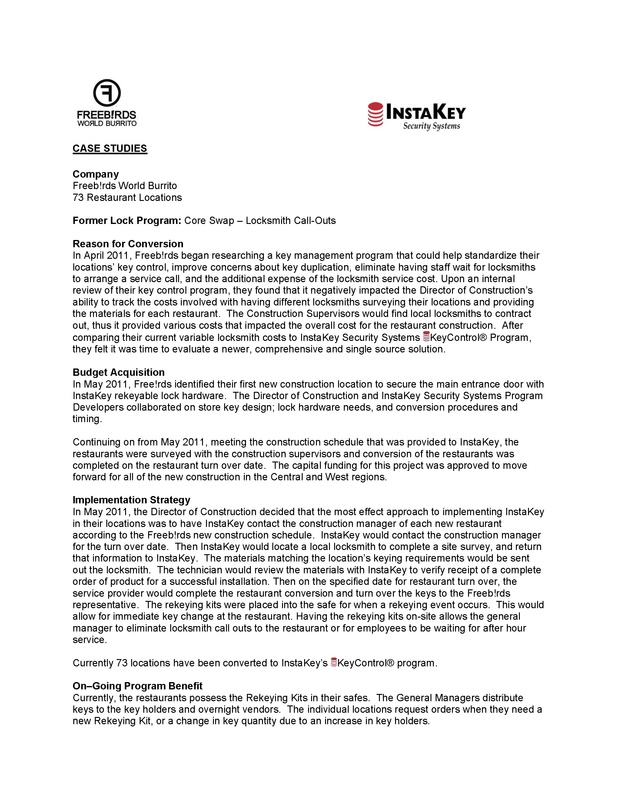 Upon an internal review of their key control program, they found that it negatively impacted the Director of Construction’s ability to track the costs involved with having different locksmiths surveying their locations and providing the materials for each restaurant. The Construction Supervisors would find local locksmiths to contract out, thus it provided various costs that impacted the overall cost for the restaurant construction. After comparing their current variable locksmith costs to InstaKey Security Systems Key Control Program, they felt it was time to evaluate a newer, comprehensive and single source solution.